Bucharest, Romania [A. Mazza, A. Horja, N.Burcea, CD EUDNews]. October 31, 2014. 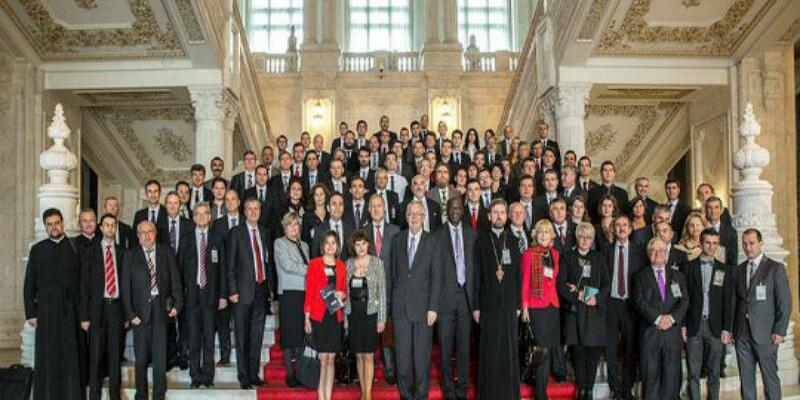 120 leaders from important Romanian universities and prestigious universities from US and the EU, along with top officials, ambassadors and international experts, participated last week in an international scientific conference on the topic of freedom of religion and belief organized in the Human Rights Hall of the Romanian palace of Parliament. Initiated by “Conscience and Liberty” Association in Romania, and in collaboration with the Committee for Legal Matters of the Chamber of Deputies, the event created the opportunity for an ample debate regarding the law, religion and freedom in the context of globalization. “We wish political leaders and those responsible for educating future generations would understand the benefits of promoting a culture that includes all-religions and not only a culture of tolerance towards religious beliefs representing the majority in certain areas. It is important to give future generations a message of peace and respect based on the values of human dignity”, said Nelu Burcea, president of the “Conscience and Liberty” Association. “The promotion of inter-denominational dialogue and the endorsement of politics preventing inter-religious dialogue have given Romania a great advantage, that of social stability. By supporting religious liberty and by condemning any attack against religious communities, Romania has also gained a better social cohesion, demonstrating the advantages of inter-religious dialogue,” stated Titus Corlatean, Minister of Foreign Affairs. Addressing foreign guests, as well as ambassadors and representatives from various universities, Minister of Foreign Affairs Titus Corlatean highlighted the importance of religious activity in all denominations, without any restrictions, according to their own norms and traditions, beliefs, dogma and specific rituals. “Romania supports religious liberty, religious tolerance, non-discrimination based on religion, and it condemns attacks against any religious communities, while being actively involved in the international community that promote this dialogue”, said Minister Titus Corlatean. Titus Colatean has also highlighted the important role played by politicians, media, opinion-makers, along with clerics, in promoting tolerance, inter-religious and inter-denominational dialogue and, consequently, in ensuring a climate based on mutual respect, regardless of religious orientation. The chief of Romanian diplomacy ended by reiterating that cultural and religious diversity represents a source of development for society and that the current direction in Europe also proposes redefining national identity, but not based on elements which differentiate us, rather, based on common values. The same kind of messages supporting freedom of religion and belief was reaffirmed by another top Romanian official, Mihnea Costoiu, Minister Delegate for Higher Education, Scientific Research and Technological Development. At the same time, Minister Mihnea Costoiu stressed that education can play a major role in overcoming these problems. “Before we start educating we must understand that when accepting religious diversity, problems will arise and will possibly even overwhelm us. History can repeat itself at any moment. Let’s not forget that laws are only strong if they are enforced, only if they are independent from our individual preferences and transient goals. I think that the basis for education is communication, and it has to be adapted to an open mind and form of understanding,” showed Mihnea Costoiu. In his opinion, religious liberty is more important than any country and any nation should make every effort to protect it. “The relationship between a human being and his divinity is very personal, and carries its own responsibility. Nobody and nothing has the right to intervene by telling somebody how to pray, or who to pray to,” stressed Minister Costoiu. “Having Romania's country officials among the participants, shows us the determination towards a total respect of religious liberty even though, at times some people have committed criminal acts, ignoring the biblical principles of liberty and the laws of the country. We trust that, sooner or later, these acts will be legally and spiritually sanctioned,” said Nelu Burcea, president of “Conscience and Liberty” Association. Both John Graz and Ganoune Diop appreciated the progress made in Romania towards freedom of religion and belief during the last 25 years, noticing the constant efforts of “Conscience and Liberty” Association, in addition to the role of political and religious leaders. “In Romania I’ve found an extraordinary will to build for the long-term and on solid ground. The events have brought a lot of attention among experts, political leaders and society! I congratulate you for that”, said Graz. "Protect freedom of conscience, religious freedom and all the other kinds of freedom – and you will fully experience a God-given dignity. Love cannot be forced. It can only be experienced where there is freedom to choose or change," this is true everywhere, also in Romania. Among the principal advocates for religious liberty and the separation of church and state were the leaders of the Seventh-day Adventist Church. They stressed that, from its early days, the Seventh-day Adventist church has always been concerned with freedom of religion and belief but, implicitly, about the relationship between church and state. “The reasoning behind this constant investment of time, energy and funds in defending and promoting religious liberty, does not originate only to defend ourselves, as many would be tempted to believe, but it is also driven by love. If God loved us so much as to give us free will, who are we to steal this right from our fellow men?” church leaders reported. Aside from discussions on religious liberty, the event that took place last week in the Romanian Parliament was also an occasion for unique musical moments. Seen as islands of relaxation dedicated to worldwide experts who met for this intense event, the musical moments performed by Iridia Dragoti-Mazza, an Adventist professional mezzo-soprano, turned into a distinct event. At the invitation of the Romanian officials, Irida Dragoti-Mazza performed, in different moments of the event, 4 pieces form the Christian repertory, including 'The Lord’s Prayer' and 'The Holy City', stirring standing ovation. Sacred non-orthodox music is not very common in Romania, a majority Orthodox and post-communist country. Irida’s performance was greatly appreciated by all the participants, and above all by several ambassadors, politicians, artists, and important personalities. By: Andreas Mazza, Aurelian Horja, Nelu Burcea, CD EUDNews.